College is a lot of things to a lot of people. It is an unmatched learning experience with much of it coming outside the class. Although the professor’s union might not like me saying this, it is much more than going to class and taking notes. To students who are inspired or have signature experiences (copyright pending), it is often life changing. Students who take a proactive role in their own education typically have the greatest experiences. Studies show there are six drivers of student engagement. When students find professors that excite them about learning and/or professors who care about them as individuals, they are more likely to become engaged. Similarly, when they find a mentor who encourages them to pursue their dreams and goals, they are more likely to have a great experience. Students get engaged when they participate in a long-term project, often a research project under the direction of a faculty member. Outside the physical classroom, jobs or internships that allow them to apply what they are learning or give them hands-on experience make a world of difference. Finally, students that are heavily involved in extra-curricular activities are excited and engaged. A large part of our job as faculty is to open windows and doors of opportunity to these students or guide them when they find their own windows and doors. For a long time, the faculty in the political science department have actively encouraged students to reach a little higher than they thought they might. Faculty have encouraged and mentored students who were engaged in undergraduate research. Many faculty members bring bright and motivated undergraduates into their own research projects. Outside the classroom, or in what becomes other “classrooms,” there are all sorts of experiential learning activities and extracurricular activities that complement and supplement the student’s traditional educational experiences. Collectively, we refer to them as signature experiences. It is our primary initiative for the year. We want to raise funds to help these students enhance their engagement, expand their horizons, (hopefully) just inspire them, and, for a few, change their lives. We think of signature experiences broadly, but the following are some examples of the kinds of programs and groups that we are supporting. We sponsor a number of groups, like Model United Nations, Speech and Debate Club, the Mock Trial Team, and the Tennessee Intercollegiate State Legislature (TISL). Students who participate in these groups typically remain active as alumni. We have a number of internships including some with the State Legislature. We also lead study abroad program trips to London and to Italy. There are 27,000 students at UT; a little fewer than 21,000 of those students are undergraduates. A little closer to our home in McClung, there are more than 500 political science majors. Each of these students has an interesting story to tell. Some of those stories we could actually repeat. The broader question, however, is if there are all these students doing interesting things, winning awards, and accomplishing tasks beyond their years, why are we focusing on Nathan Timbs yet again this year (read last year’s feature here)? Because Timbs is engaged and proactive in his academic pursuits. There is good news for all the students out there looking for their 15 minutes of fame – Nathan is graduating. There will be more room for stories about other students. Fear not, if you are wondering what Nathan is up to or feel like he is an old friend, just look for his latest accomplishment in next year’s alumni section. Timbs spent the summer at the University of North Texas as part of the National Science Foundation’s Research Experience for Undergraduates. This program is very selective and is a boot camp experience for students who are considering continuing on for a PhD. The program was an eight-week intensive research program with the goal of producing a unique, publishable research project. Throughout the course of the program, the 10 participants learned how to write a political science research paper, which included a literature review, theory building, and research design. In addition, the participants were also introduced to GIS and STATA (statistical methods) through a series of workshops designed to help them integrate these software programs into their research. The title of Timbs’s research project was “Democratic Backsliding as a Spillover Effect of Civil War.” His study investigates the relationship between civil war and democratic backsliding in neighboring states. Timbs worked closely with his faculty mentor, Professor Lee Walker, and graduate mentor, Meredith Winn. Although, his heart rests firmly in Knoxville, he enjoyed experiencing a different university. He had an enriching experience meeting bright students from across the country. His journey is not over yet as all of participants in the program will be attending the Midwest Political Science Association Conference in Chicago this coming April and presenting the results of their research. Some of the participants quickly decided that graduate school was not in their future. Timbs was not one of those. If anything, he doubled down and is even more interested in pursuing research opportunities and investigating PhD programs for his continuing education. Honestly, if you want to study and do research on China, where else would you go than Ecuador, South America? The proximate neighbors are both on the Pacific and are separated by a mere 10,074 miles. This was the path Alec Tripp, a junior, embarked on in the spring semester. 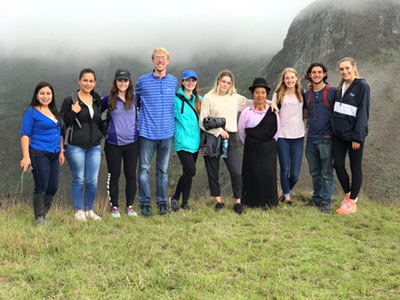 Tripp visited some the world’s greatest treasures in the Galapagos Islands, the Andes Mountains, and the Amazon Rainforest. The vibrant culture, friendly people, and turbulent political history added further layers of intrigue to the beautiful country. While he was studying and living in Ecuador, his interest was piqued by some research he was doing on Latin American relations with China. There is a great amount of history between the two global entities, despite their distance, and the potential subject combined two of his interests: the lively culture and politics of Latin America along with the uniquely defiant governmental system and history of China. Tripp wrote class essays in Spanish about China’s relationship with Ecuador and Latin America as a whole and had in-depth conversations about China’s role in the region. 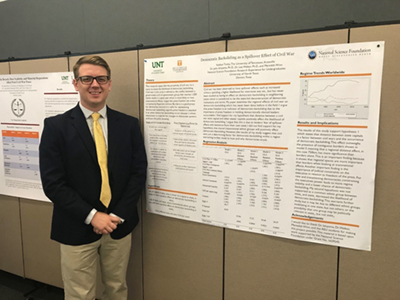 These efforts culminated into an incredible opportunity when Tripp applied to and was accepted into the University of Tennessee’s Summer Undergraduate Research Internship for 2018. Through this program, he has been working on his own research project under the direction of Professor Gary Uzonyi dealing with Sino-Latin American relations. He will have the opportunity to present the results of his project on Discovery Day at Hodges Library. He considers his project, titled “Modern Chinese Development of Latin America,” as a stepping-stone to more independent research and graduate school in political science.